I have heard of lost manuscripts of Tamil language being found. I have also heard of relics being unearthed. But this is the first I have come across a full British influenced recipe book being found in India. What a way to make use of it!!! 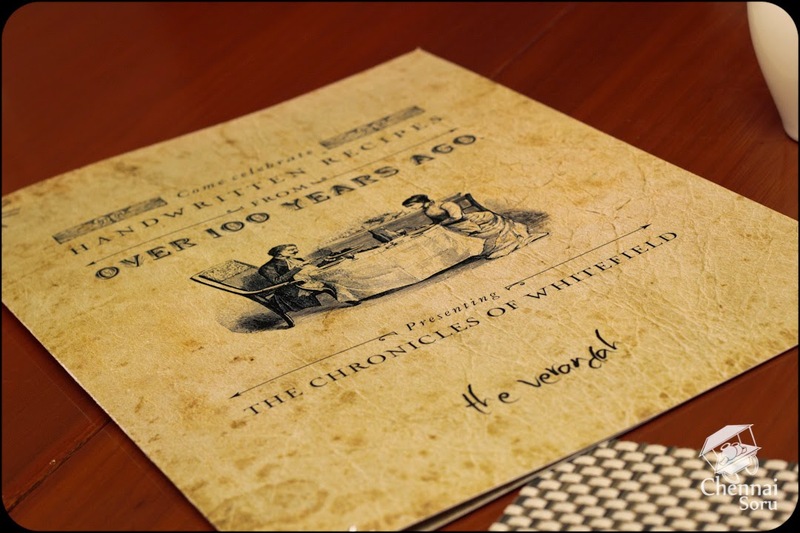 Chef Arzooman Irani the executive chef at Vivanta by Taj - Whitefield, Bangalore got hold of (was gifted) the recipe book of one the early settlers at Whitefield, Mr. Harry Blake. Once the chef got hold of the book, he did not just sit on this vast resource. Rather he used knowledge and skill to bring the age old recipes to life. 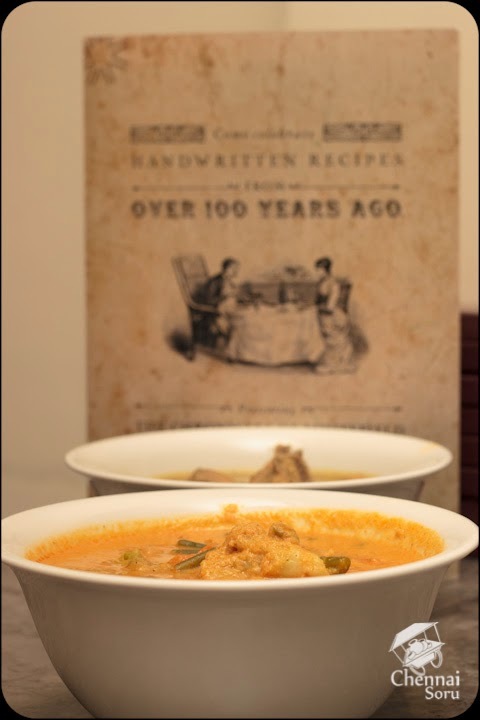 The menu not only showcases the dishes which were consumed by the then settlers, but also brings to life on how the Indian available produce were altered to suite their palates. Vivanta Taj, Chennai took this menu and brought it down to Chennai to one of the oldest colonial houses in the city for the Madras's 375th birthday. 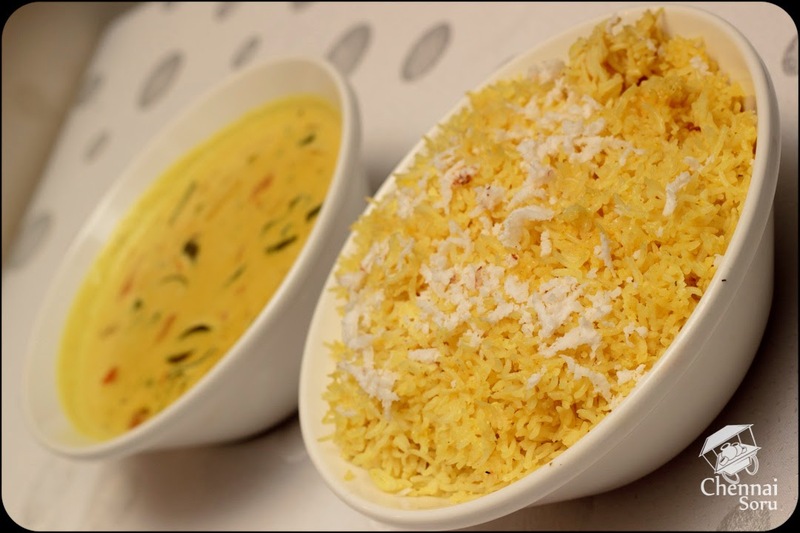 This food can relished at the Verandah from 22nd to 31st of August. To top all this they had also launched a special Cocktail menu called the Colonial Hangover Cocktail. Me being a Tee totaler stuck to sampling the non-alcoholic versions of the same. I was happy sampling the non-alcoholic versions of the popular drinks. I first sampled the Ginger Wine which was blend of sweet with gingery after taste. Stunning concoction I must say. 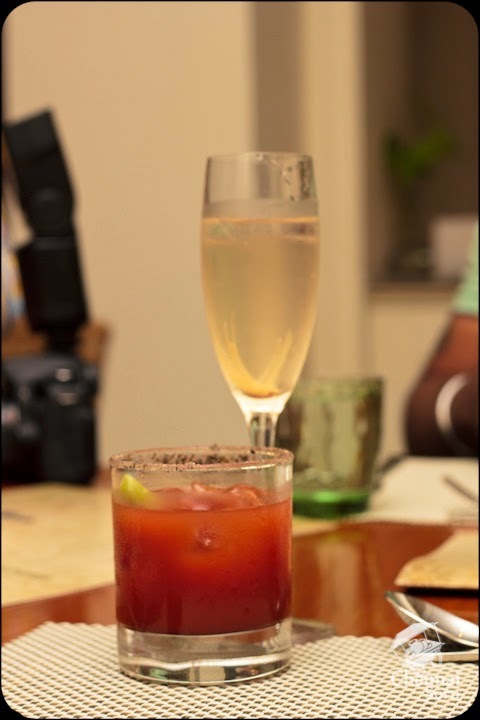 Then there was the ever so popular Virgin Mary which is essentially a non-alcoholic version of the Bloody Mary. Finally the Earl of Raj which was had a blend of Earl Grey Tea, Cinnamon, Cardamom, lime juice and bay leaf. It had a peculiar flavour to it. 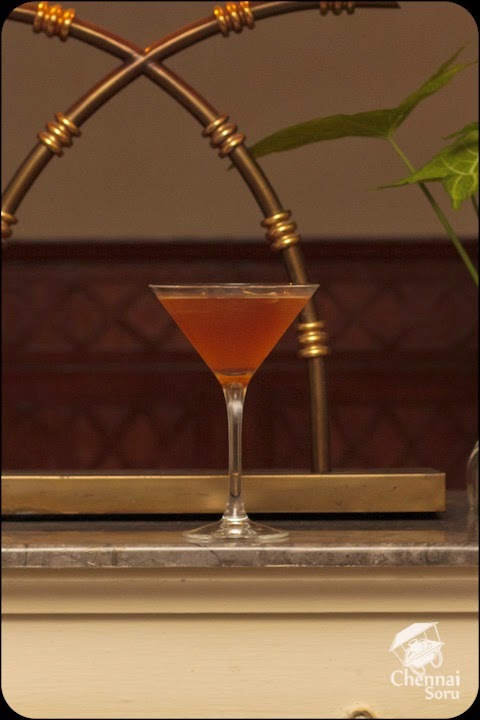 Every sip one would take, gives you a hit of the various components which makes it rather special. Drinking down our spirits, we started the dinner with Mulligatawny Soup which was essentially a lentils broth spiced up with peppers and finally giving it a twist with finely cut apples. 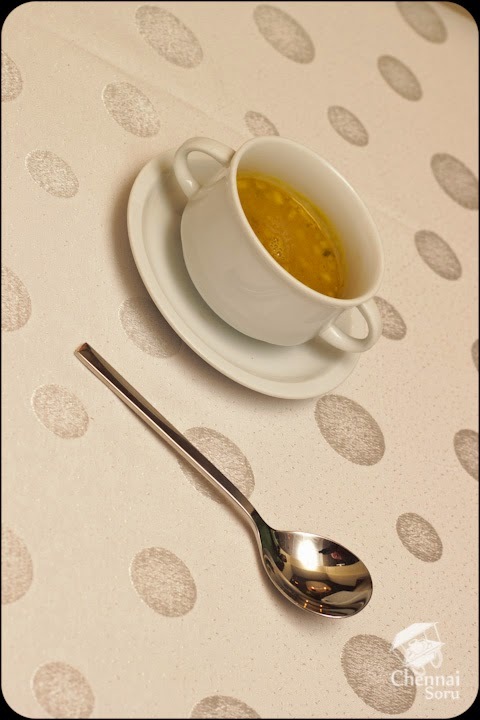 A soup full of flavours and textures. 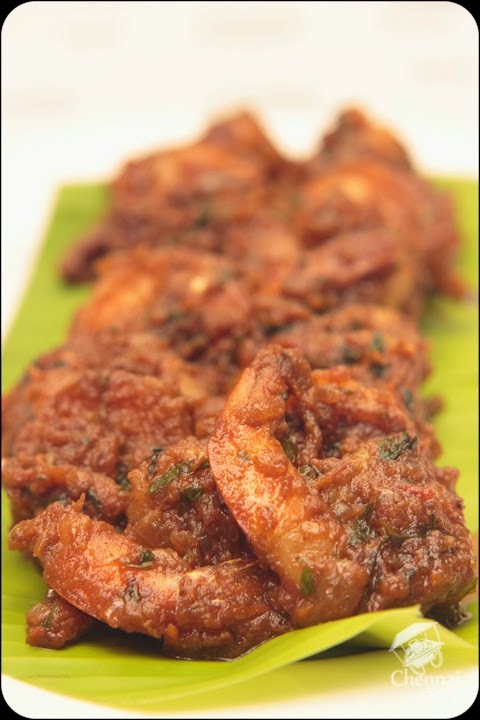 Then moving on, there was my kind of dish Spicy Prawn Masala. 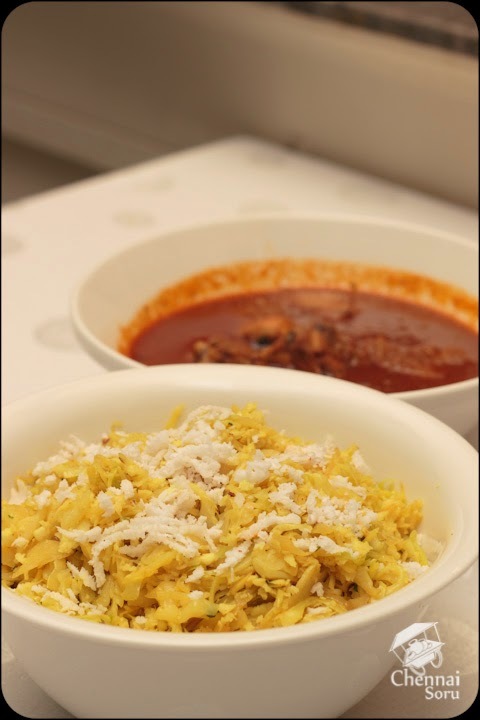 A hint of Indian Masala, cooked to perfection, this is something I would love everyday. Moving on to the mains we had Tomato Rice and Coconut rice to go with Veg. Stew, Harry's Signature Fish Curry, Mutton Ball Curry, Country Captain Chicken and Cabbage fry. The Tomato rice was a little light for my taste. I am used to South Indianized full on tomato flavoured rice, while this was more of subtle tomato touch. 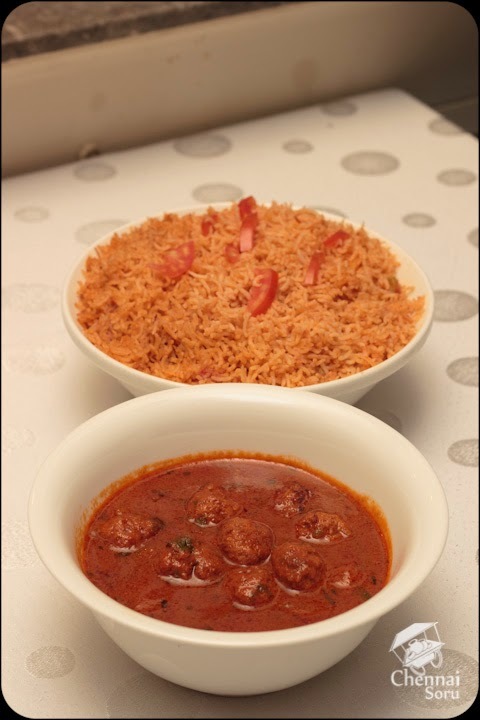 The flavours of the same was greatly accentuated when had in combination with Mutton Ball Curry. Loved the deep flavours of mutton balls and super softness of the same. My pick of the lot was mixing Coconut rice with Veg.stew and a dash of Country Captain Chicken. Had enough sweetness and slight hint of heat to balance it out. 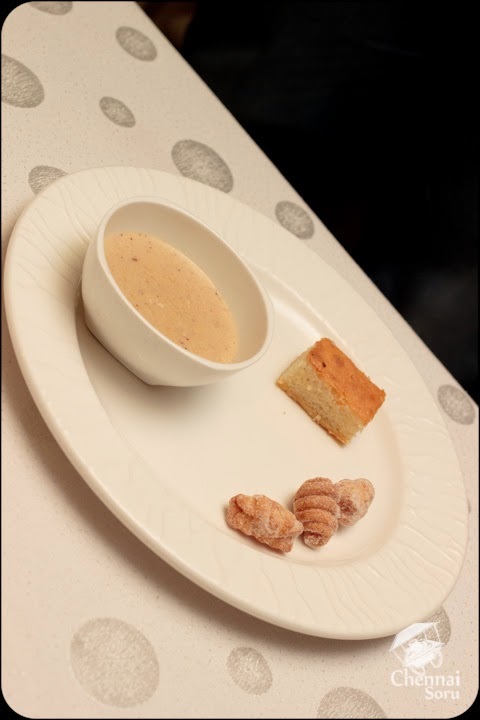 On finishing the mains,we were served with a small dessert platter which had Sooji Pudding, Coconut Pudding and finally Kulkuls. Of the lot my pick was the Coconut pudding. I just could not settle for one. There can't be a better setting to bring this anglo-indian culinary delight to life. The rich heritage of the building compounded by the food made it a night which I would never forget. A meal for two without alcohol should cost upwards of Rs 3000/- . If you are in the mood to experience history through food, this is the place. 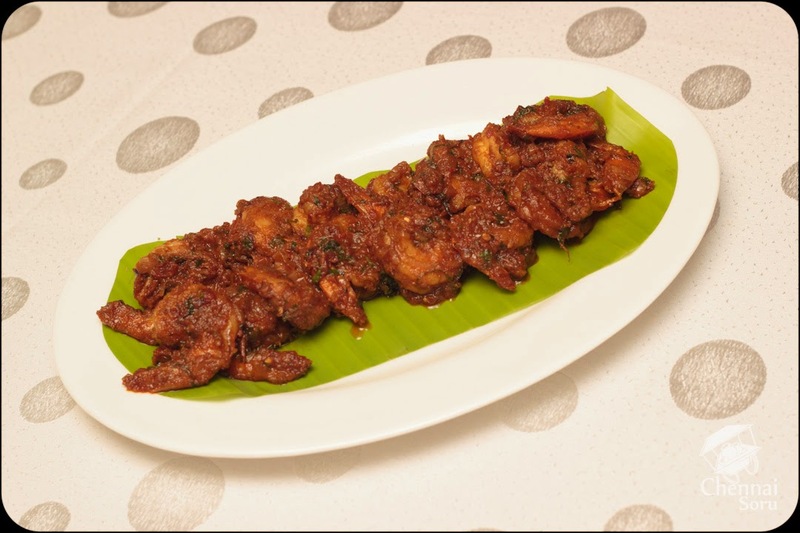 This Anglo-Indian Food Festival is on from 22nd August to 31st of August at The Verandah at Taj Vivanta, Chennai. Taj Vivanta is located on Binny Road, right next to Spencers plaza's car parking entrance.